The Global Volcanism Program has no activity reports for Escanaba Segment. The Global Volcanism Program has no Weekly Reports available for Escanaba Segment. The Global Volcanism Program has no Bulletin Reports available for Escanaba Segment. The Global Volcanism Program has no synonyms or subfeatures listed for Escanaba Segment. The linear, N-S-trending Escanaba Segment, the southernmost of the Gorda Ridge, lies immediately north of the Mendocino Francture Zone off the coast of northern California. The axial crest of the 130-km-long segment, also known as the Escanaba Trough, is about 3-5 km wide at the northern end and increases to 18 km to the south near the junction with the Mendocino FZ. The rift valley floor of the slow-spreading segment lies at about 3200 m depth, bounded by faulted walls about 1500 m high with unusual gold-bearing massive sulfide deposits in sediment hills at the base of the scarps uplifted by volcanic sills or lacoliths. Thick sediment deposits from the continental margin enter the axial trough from the fracture zone and thin to the north. A preliminary uranium-series date of Holocene age was obtained from a basaltic lava flow in the axial valley in the less-sedimented northern part. Davis A S, Clague D A, White W M, 1998. Geochemistry of basalt from Escanaba Trough: evidence for sediment contamination. J Petr, 39: 841-858. Goldstein S J, Murrell M T, Janecky D R, Delaney J R, Clague D A, 1992. Geochronology and petrogenesis of MORB from the Juan de Fuca and Gorda ridges by 238U-230Th disequilibrium. Earth Planet Sci Lett, 109: 255-272. Tormanen T O, Koski R A, 2005. Gold enrichment and the Bi-Au association in the pyrrhotite-rich massive sulfide deposits, Escanaba Trough, southern Gorda Ridge. Econ Geol, 100: 1135-1150. Volpe A M, Goldstein S J, 1993. 236Ra-230Th disequilibrium in axial and off-axis mid-oecan ridge basalts. Geochim Cosmochim Acta, 57: 1233-1241. There is no Deformation History data available for Escanaba Segment. There is no Emissions History data available for Escanaba Segment. A NOAA/PMEL map shows the setting of the Escanaba Segment at the southern end of the Gorda Ridge west of the coast of northern California. The linear, N-S-trending segment is the southernmost of the five segments of the Gorda Ridge and lies immediately north of the Mendocino Francture Zone. 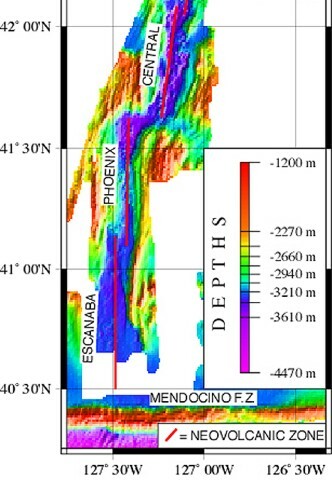 The axial crest of the 130-km-long segment, also known as the Escanaba Trough, is about 3-5 km wide at the northern end and widens to 18 km to the south near the junction with the Mendocino Fracture Zone. Courtesy of NOAA NeMo Observatory. There are no samples for Escanaba Segment in the Smithsonian's NMNH Department of Mineral Sciences Rock and Ore collection. IRIS seismic stations/networks Incorporated Research Institutions for Seismology (IRIS) Data Services map showing the location of seismic stations from all available networks (permanent or temporary) within a radius of 0.18° (about 20 km at mid-latitudes) from the given location of Escanaba Segment. Users can customize a variety of filters and options in the left panel. Note that if there are no stations are known the map will default to show the entire world with a "No data matched request" error notice. Large Eruptions of Escanaba Segment Information about large Quaternary eruptions (VEI >= 4) is cataloged in the Large Magnitude Explosive Volcanic Eruptions (LaMEVE) database of the Volcano Global Risk Identification and Analysis Project (VOGRIPA).